The overarching goal of the PAL Clinical Priority team is to sustainably improve the wellbeing of patients and healthcare staff, by empowering everyone to take control of their own health and lifestyle, ultimately reducing the burden on the healthcare system. One hour training session for healthcare professionals on ‘Understanding Physical Activity and Cancer’ Sign up to attend a live online webinar or watch an online e-resource. You may have seen our offering alongside MIE FitQuest at the RCGP Conference 2016. See how the GP population measured against the national average in the article here. 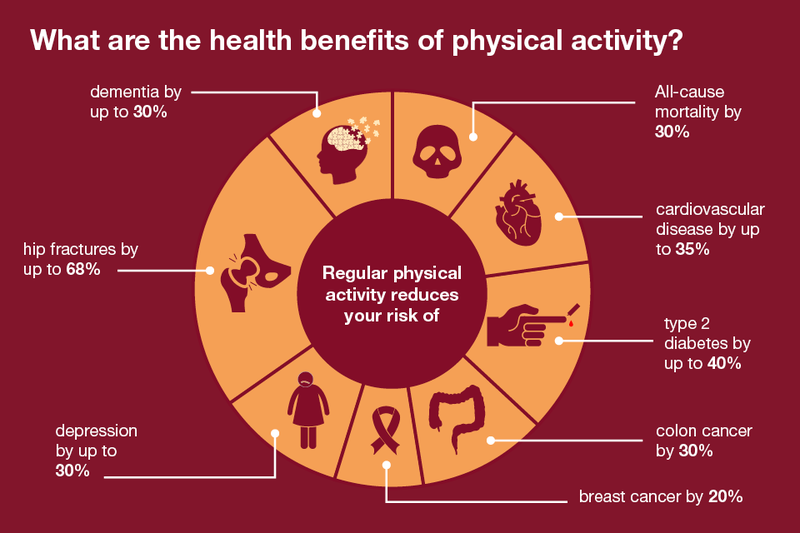 Infographic - What are the health benefits of physical activity? 23 and 1/2 hours. A Doctor-Professor answers the old question "What is the single best thing we can do for our health" in a completely new way. Created by Dr Mike Evans, this video is ideal for waiting room screens. Benefit from activity. This website shows how being active can improve your health and reduce your risk of developing a number of health problems. It’s full of useful advice for everyone, whether you have a medical condition or not. Macmillan physical activity webpages Here individuals can click through to ‘Activities near me’ and use the ‘In Your Area’ tool to search for local activities, which includes physical activity services.